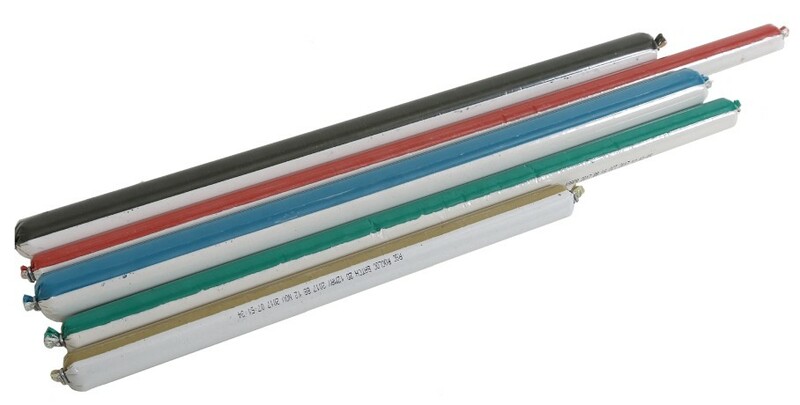 Cartridges with various setting times, lengths and diameters are available to cover a wide range of applications. 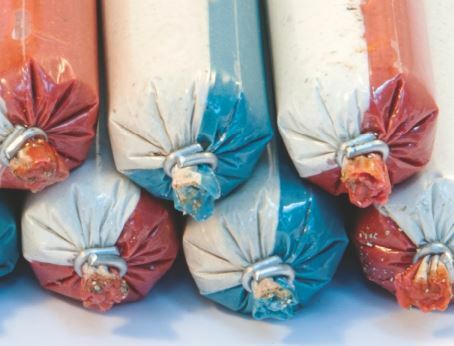 Resin cartridges have a cylindrical shape and consists of two separate compartments containing a resin mastic and a catalyst paste. The two components are sealed within a polyester film tube. A special plastic cap with radial projected ends (known as a "parachute") may be fitted to one of the cartridge tips and acts as a retaining element preventing the cartridge from sliding out of the bore -hole. The choice of cartridges depends on the diameter of the rock bolt and bore -hole. An annular gap of 3 mm is ideal to permit rupture of the cartridge membrane and to ensure adequate mixing of the two components. After drilling, the desired number of cartridges are inserted into the bore -hole followed by the rock-bolt. The end of the rock-bolt is angle cut so as to form a sharp tip to ease membrane rupture. As soon as the rock -bolt is inserted into the bore-hole it is spun in order to facilitate the mixing of the resin with the hardener. Spinning is stopped as soon as the rock -bolt is inserted to full length of the bore-hole and as per the recommended “Spin Time”. The Rock-bolt is then left immobile (as per the recommended “Hold Time”) in order to allow the hardening reaction t o take place. 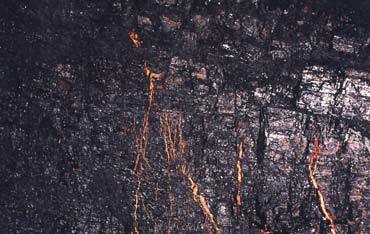 The hardening time (hold time) depends on the resin set time, the rock temperature as well as to the energy given to the system while the rock-bolt is inserted into the bore-hole. 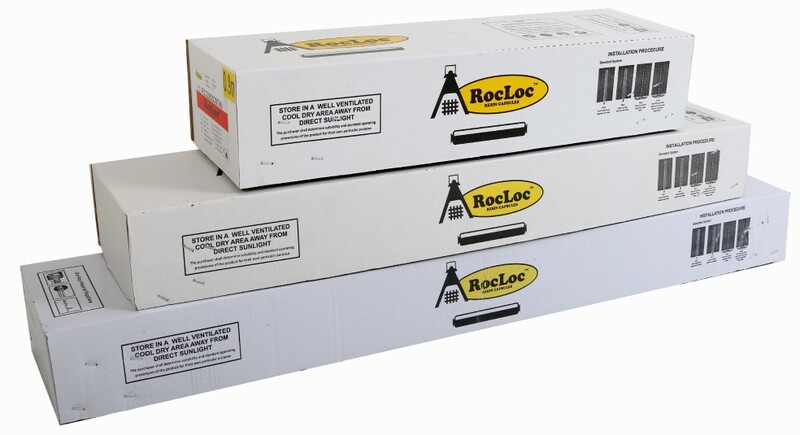 The required diameter and length of RocLoc® cartridges is calculated by estimating the volume of the annulus between the bolt and the borehole. Cartridges are manufactured in diameters of 21, 23, 25, 28, 32 and 35 mm and standard lengths of 380, 400, 450, 500, 600, 900, 1000, 1100 and 1350 mm. Other lengths and diameters of the cartridge can be manufactured upon request. 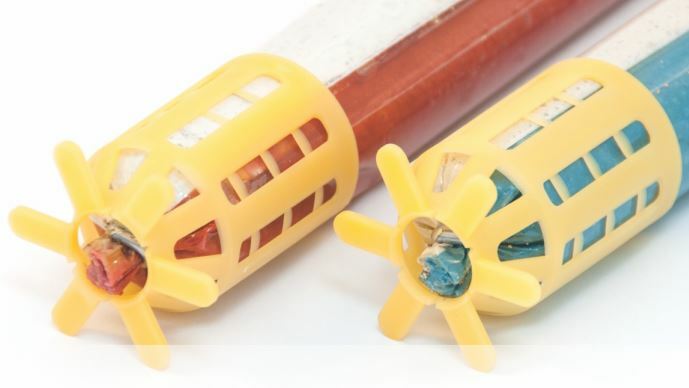 RocLoc® resin cartridges are produced in a variety of gel times. Generally, the sum of the Spin Time and Hold Time is the Gel Time. The time from the start of mixing until the resin starts to harden is the Gel Time. Gel Time is influenced by the temperature of resin, strata and bolt. Additionally, the amount of heat generated in mixing during the spin time also affects Gel Time. Field trials are recommended. The above data are values obtained in laboratory tests. They may vary according to site applications conditions.